As Christmas comes along, so will winter, however that doesn’t necessarily mean that all winter designs should follow Christmas ones! 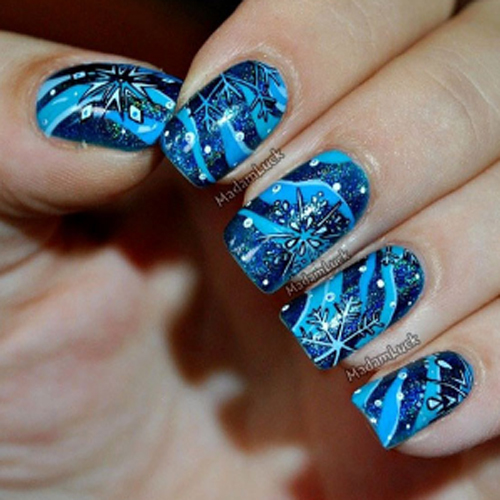 So for those that do not necessarily want to always go for Christmas nail designs, here are some winter ones for you. A mix of dark blue and a glittery white is sure to make your nail color choice a hit with your family and friends. 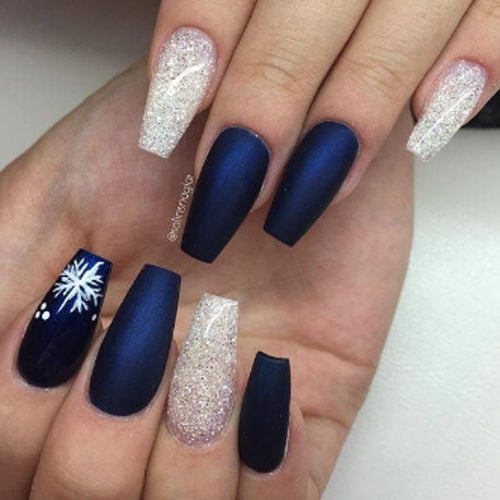 The addition of the white snowflake on the dark blue base really adds a contrast and some life into the nails. 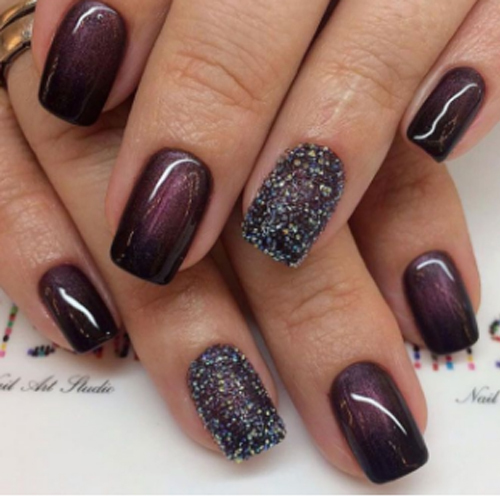 A dark purple based nail colour gives off a nice impression of a warm time next to the fire pit at home with some hot coco. The glittered nails has a splash of life and creativity to the design, and is also perfect for ringing in the new years. 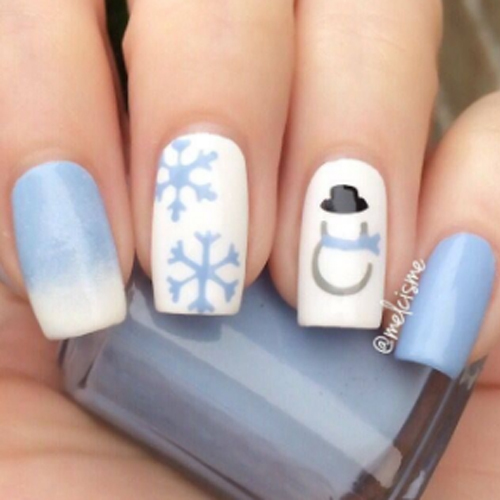 This adorable light blue and white nail design and color scheme just screams out winter and the joy that comes with it. The snowman and snowflake is also a really neat yet simple addition. This colour choice and design is a classic to the winter collection as the light blue and white sparkles really reflect the blue and white ice of winter. This iridescent glitter nail design is a funky twist on your average french tip. This seemingly intricate design is actually quite easily recreated by those with time and patience by their side and voila, a winter nail design that makes you look like a pro! This silver and white combo is perfect for the end of the winter season. 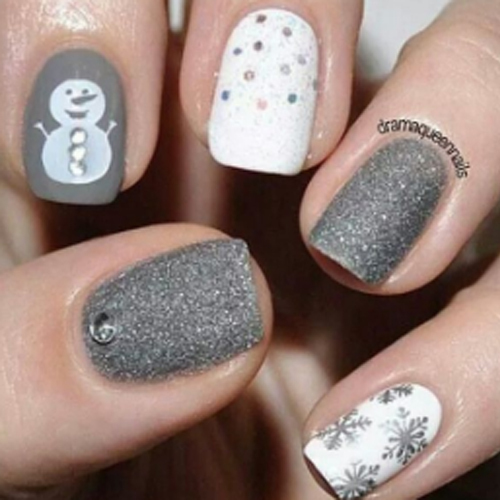 While the snowman and snowflakes create a contrast against their background, making your nails stand out against the others, the silver glitter acts as a cool toned base, perfect for making a dazzling start to the new years! 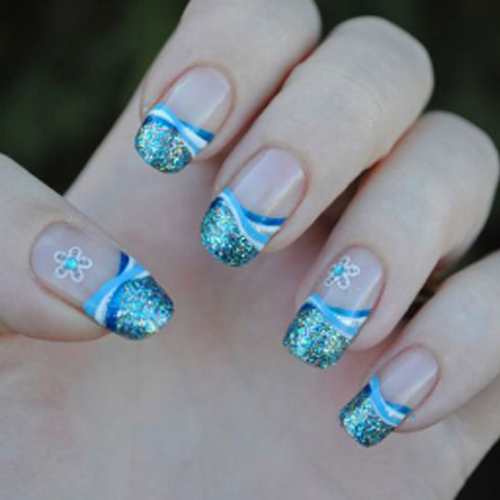 A deep and dark blue base colour to provide a heavy impression on those that you meet, however, paired with the lighter shades of blue stripes and snowflake patterns which adds fun, this nail design is a perfect between the two. If you’re looking for a more complicated design, this is it! 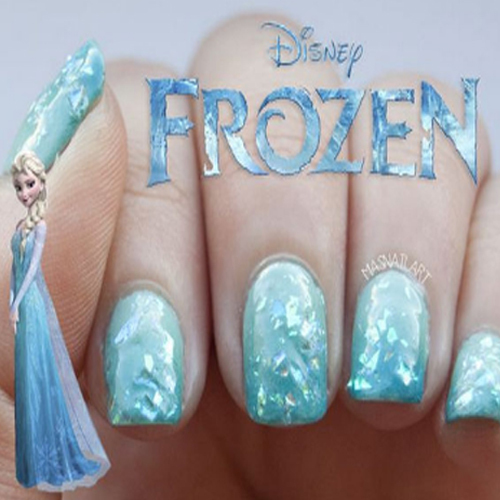 With foils that create texture on your nail, you’re sure to wow your friends and family with this design inspired by Disney’s Frozen! The iridescent foils not only catch the light but also give the look of rocky ice mountains and the cool toned blue polish ombre is perfect for the season.